In the Cavan Burren Park forest, and immediate surrounding area, meticulous fieldwork and recording has so far produced an account of some 30km of relict walling with evidence of prehistoric stone-working, 150 dwelling sites, 160+ modified monumental boulders (which includes 40 ‘propped stones’), traditional rock art at 25 new sites plus an additional 85 ‘sculpting’ rock art sites, all previously unrecorded. Within the Cavan Burren Park itself there are more than 50 hut sites and over 10km of prehistoric walls. Incorporated within these settlement features are over 150 boulder monuments – 100 having either Rock Art and/or Rock Sculptings. Nowhere else in Europe is rock art to be found in the context of settlement features in such numbers. 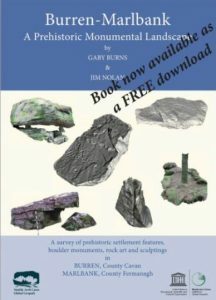 In addition to the rock art there is a variety of boulder monuments and a form of rock art, sculptings, as yet generally unknown to archaeologists. The extensive area covered by the settlement features and boulder monuments can be described as the ‘other’ Cavan Burren as it is slightly of the ‘beaten track’. Nevertheless, although not on the new paved trails, the sites are all easily accessible from the forest road, are well signposted and have maintained trails through the trees with waymarker posts throughout. The boulder monuments, rock art and sculptings are mostly incorporated in the walls and may be regarded as all more or less contemporary with the settlement features. Based upon existing evidence these are probably contemporary with the Giant’s Leap Wedge Tomb. The limestone bedrock in this area has prevented soil build up, in fact soil erosion has meant all these prehistoric settlement features remain on the surface – a total 30km of wall and over 150 hut sites in the extended area surrounding Burren – despite this no excavation has yet been undertaken by any Irish University. It would probably only take one excavation of a hut site to date the whole extended complex. The Limestone geology of this area plays an important role in determining what archaeology survives see geology animation below and also see the Geology page.